Astro's eBay store sells refurb Astro products, and today they're even cheaper than usual. 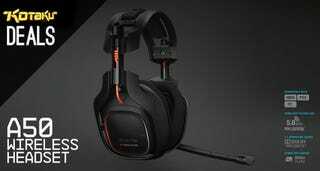 The star of the show here is obviously the Astro A50, which is down to $160 after factoring in the extra 20% off coupon when you spend $10 or more. The A50 was the winner of the Kinja Co-Op for Best Gaming Headset, and a contender in the Lifehacker Hive-Five for Best Headset with Attached Microphone. It's wireless, 7.1, and works with pretty much all your devices.